Oasis Environmental Group, LLC offers companies in Hawaii a better solution for managing their environmental compliance. We have a team of trained field technicians to come to your facility, package your items in the most cost effective manner to help in reducing the costs and better maximizing your budgets. We go above and beyond the preferred standard method by providing compliant solutions for the management of retired assets. 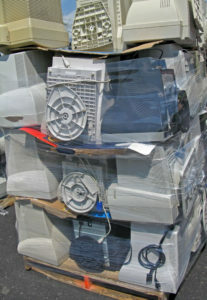 The new forecast in Hawaii of no EPA approved E-waste recycling centers has charged Oasis with continual searching of the mainland for responsible Electronic Recycling facilities to handle our clients computer related waste. All of our recyclers have to be EPA approved facilities and in conjunction with Oasis all our recyclers go above and beyond the preferred standard method by providing compliant sustainable solutions for the management of retired IT assets. Call now for an estimate on how we can help keep your Hawaii Business in compliance.